France is teetering on the brink of collapse. British troops are desperately fleeing Dunkirk. Germany is winning the war. Its next target is Britain . . . and Ireland. In neutral Dublin, opinions are divided. Some want Germany to win, others favour Britain, while most want to stay out of the war altogether. In this atmosphere of edgy uncertainty, young lieutenant Paul Duggan is drafted into G2, the army’s intelligence division and is given a suspected German spy to investigate. Before he can probe further, he is diverted by a request from his politician uncle to try and find his daughter, who’s gone missing, possibly kidnapped. Enlisting the help of witty Special Branch detective Peter Gifford, the two lines of inquiry take Duggan into the double-dealing worlds of spies and politics. An addictive thriller that will keep you glued to the page, right through to its heart-pounding finale. It is the first book in the Echoland series. 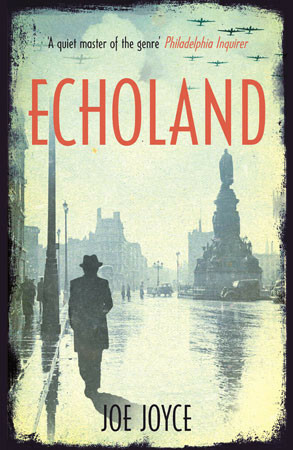 Joe Joyce is the author of five thrillers: Echoland, Echobeat andEchowave (all set during the Second World War in Dublin); The Trigger Man and Off The Record; a history/biography of The Guinnesses and a critically acclaimed play, The Tower, about James Joyce and Oliver St John Gogarty. He is co-author with Peter Murtagh of The Boss, the classic account of Irish politician Charles Haughey in power, and Blind Justice, about a celebrated miscarriage of justice in Ireland in the 1970s. He has worked as a journalist for The Irish Times, The Guardian, and Reuters news agency. He lives in Dublin.